Product #21492 | SKU 39524 | 0.0 (no ratings yet) Thanks for your rating! The Kensington Presentair Bluetooth Presenter, Laser & Stylus is a versatile presentation tool that slips easily into a shirt pocket for safe keeping. When you're ready to use it, the built-in presenter features intuitive 4-button controls that allow forward and back control of PowerPoint and Keynote presentation software with no drivers needed. 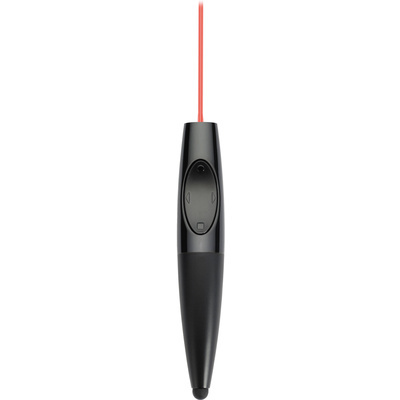 There's also a powerful red laser pointer to help you illustrate your point and a button for a blank screen option. Presentair communicates with your laptop via Bluetooth from up to 30 feet away. For those times when you incorporate your tablet into a presentation, just use the responsive, touch-sensitive stylus tip to make notes, annotations and illustrations. The battery of the Presentair lasts for up to 9 hours under normal usage, and last for 10 days in standby. To recharge, just plug the included micro-USB cable into the Presentair. Additionally, the Presentair comes with a carrying case so you can easily tote it along to the next destination.